I’ve been on a mini quest for the perfect pie crust. I love when they’re flaky, but I want a buttery crust. I’ve tried a couple different recipes, with some different combos of all butter and part butter-part shortening. Out of principle, I refuse to make an all shortening crust. It just seems too artificial, even if it means it’s flakier. Well, I think I found it. Combining 2 different recipes made for a delicious, buttery crust and it’s now my go-to pie crust recipe. I found that I prefer making mine in the food processor. Maybe because it’s still kind of new to me… But anyways, combine the dry ingredients… Then pull out your frozen butter. The colder the better. One of the biggest rules for pie crusts is to keep everything cold. Pulse it, beat it, or cut it into the flour to leave chunks no larger than small lima beans. I like my butter larger than the normal pea size called for in pie crust recipes because I found that it helps with the flakiness. Mmmm flaky crust. 🙂 You can just see the butter running in through the dough! Chill and then you’re ready to roll! Go for about ⅛-inch thick. Plate it up, and make a pretty crust… Prick it with a fork, too. Then it’s time to weight it. I like to use rice, and I save it in a bag so I can keep reusing it. Not all recipes need to be weighted, but I’ve had some bad experiences with shrinking and puffing, so I weight whenever I blind bake. Bake it up with the weights, then remove the weights and finish baking. A trick I learned to prevent leaking and soggy crusts is to brush the bottom with egg white. If you’ve been looking for the perfect all-butter crust, you must give this a try! Note: If making a custard or fruit pie, brush the bottom of the pie crust with egg white after removing the foil and finish baking. This will help prevent leaks and soggy crust. 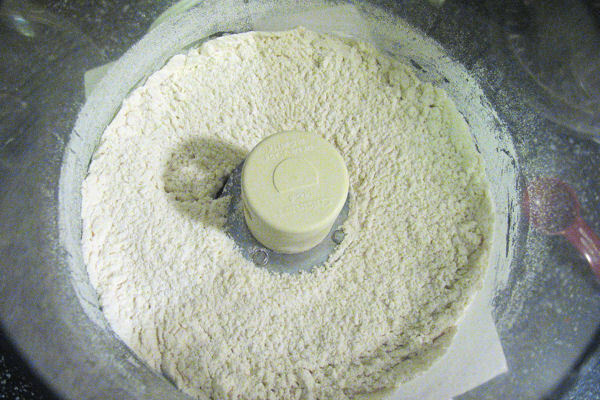 To make the dough in a food processor: In the workbowl fitted with the blade attachment, combine the flour, sugar, and salt; pulse a few times to mix. Add the butter and pulse until the mixture resembles coarse cornmeal, with the butter pieces no larger than small lima beans. Pour the flour-butter mixture into a medium bowl and add 3 tablespoons water. Fold together with a rubber spatula, slightly pushing down while stirring until dough starts to stick together, adding up to 2 more tablespoons of water if needed. Flatten dough into a 4-inch disk. Wrap in plastic wrap and refrigerate at least 45 minutes or up to 2 days. To make the dough by hand: In a large bowl, stir together the flour, sugar and salt. 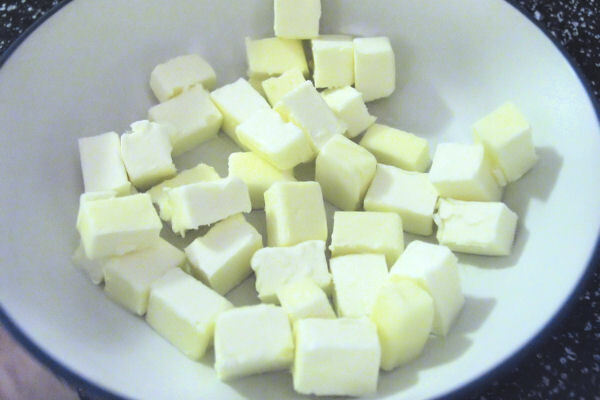 Using a pastry cutter or 2 knives, cut the butter into the flour mixture until the texture resembles coarse cornmeal, with butter pieces no larger than small lima beans. Add 3 tablespoons water. Fold together with a rubber spatula, slightly pushing down while stirring until dough starts to stick together, adding up to 2 more tablespoons of water if needed. 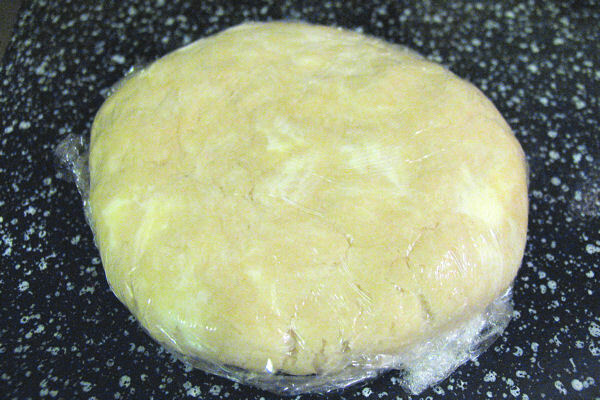 Flatten dough into a 4-inch disk. Wrap in plastic wrap and refrigerate at least 45 minutes or up to 2 days. 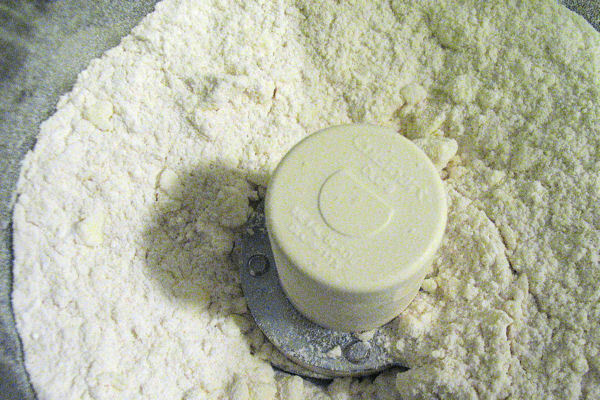 To make the dough in a stand mixer: Stir together the flour, sugar, and salt in a mixer bowl fitted with the paddle attachment. Add the butter and toss with a fork to coat with the flour mixture. Mix on medium-low speed until the texture resembles coarse cornmeal, with the butter pieces no larger than small lima beans. Add 3 tablespoons water and mix on low speed just until the dough pulls together, adding up to 2 more tablespoons of water if needed. Flatten dough into a 4-inch disk. Wrap in plastic wrap and refrigerate at least 45 minutes or up to 2 days. Lightly flour a work surface. Place chilled dough on the prepared surface and lightly dust the top of the dough or the rolling pin with flour as needed. Roll it out into a 12-inch circle about ⅛-inch thick. Lift the dough with a bench scraper as needed to make sure it doesn’t stick. 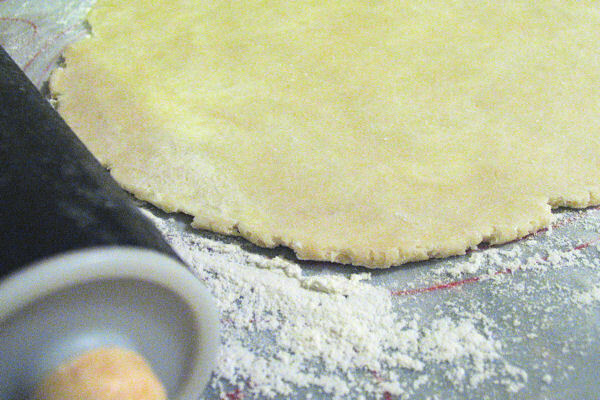 Roll dough loosely around the rolling pin and unroll into pie plate, leaving at least 1-inch overhang on each side. Ease dough into the plate by gently lifting the edge of the dough with one hand while pressing into the plate bottom with the other hand, making sure to not stretch the dough. Trim overhang to ½-inch beyond the plate rim. 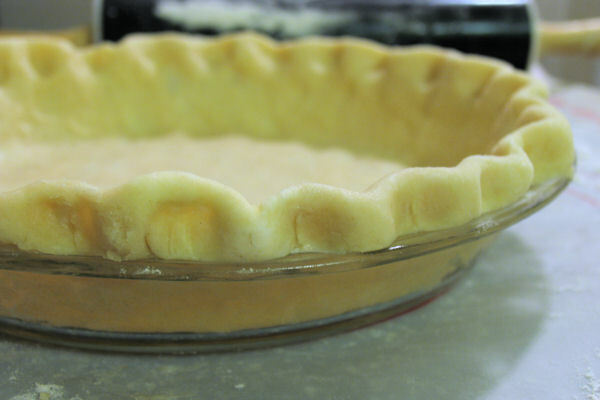 Fold overhang under itself onto the flat rim of the plate, and use a thumb and two index fingers to flute the crust. Refrigerate for 15 to 30 minutes. 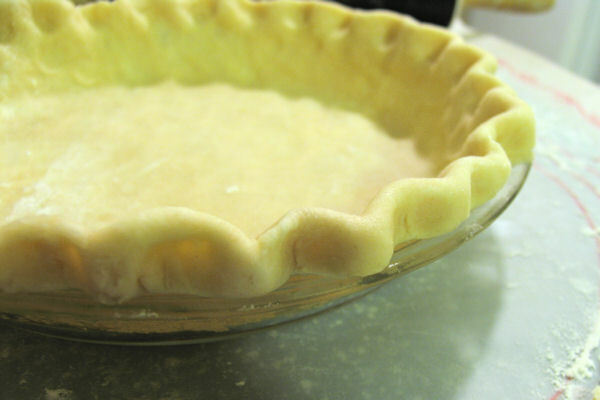 To blind bake the crust: Preheat the oven to 425 degrees F. Remove pie pan from the refrigerator and prick with a fork. 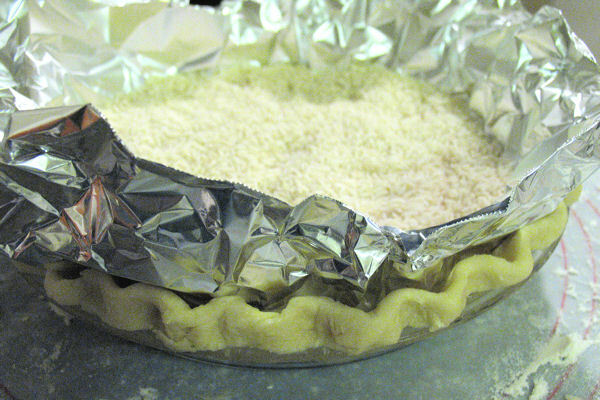 Line the crust with 2 pieces of foil, and fill with pie weights, dried beans or uncooked rice. Bake for 15 minutes. Remove foil and weights and bake for 5 to 10 minutes until crust is golden brown and crisp. Awww, now aint that dough lookin’ cute?! Yes, I just pinch it with two fingers on one side and one finger on the other side of the dough, and the one finger pushes between the two fingers to create a ripple. If that makes any sense at all…. I’ll see if I can get a picture of it at some point! Beautiful crust Stefanie! It looks fantastic. 🙂 I just love a good homemade crust. Great recipe with a good step-by-step roadmap. Thanks, Stefanie for sharing. That crust is gorgeous! 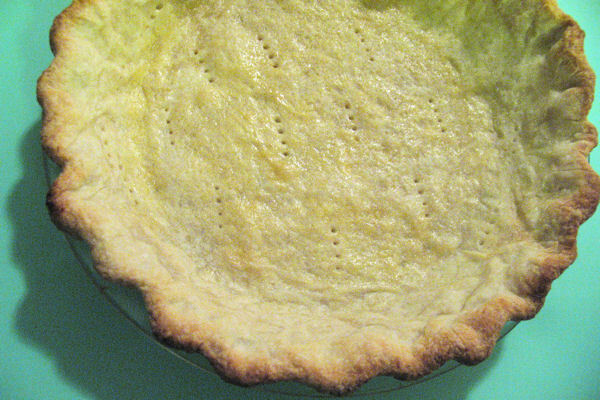 Love me a perfect pie crust, and this sure fits the bill, Stefani! I’m going to start baking my crusts blind – I usually don’t have much of a problem with shrinkage or bubbling/puffing luckily but they always seem to flop down on one side which makes things a bit… difficult to work with. Your recipe looks great – lovely golden crust… just waiting to be filled up with something yummy! it is really helpful. I had my share of trouble with pie crusts until I found the one!